Bible first-hand on the Holy Land Tour. The Holy Land Tour provides visitors of all ages with the unique opportunity to experience the people, culture, and history of the ancient Middle East. The tour can be taken at your leisure. On this approximately 2-hour interactive Biblical teaching tour, you will explore the ancient Middle-Eastern culture in which Jesus was raised and will meet characters from the time of Moses to the time of Christ. Everyone in your group will enjoy the educational and inspirational experience of the Holy Land Tour on our comfortable bus. As you tour through the Holy Land, your Guide will explain each exhibit and will stop along the way to allow you to meet Biblical characters who will help you understand the living history of the scriptures. Visiting a replica of a first century Inn typical of the type where Mary and Joseph may have asked for shelter. A first century stable typical of where Jesus was born. Walking beside the "Sea of Galilee" with Simon Peter as he speaks of his last days with Jesus. Visiting the upper room where Jesus and his disciples feasted for the Last Supper. 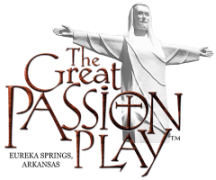 The Holy Land Tour is performed on the same days as performances of The Great Passion Play from 12:00pm until the last tour at 4:00pm, or you can also tour the Holy Land ALL YEAR LONG on every day but Sunday with a specialized guided tour. Advanced reservations are required for non-Play day tours. Call for reservations or click below!